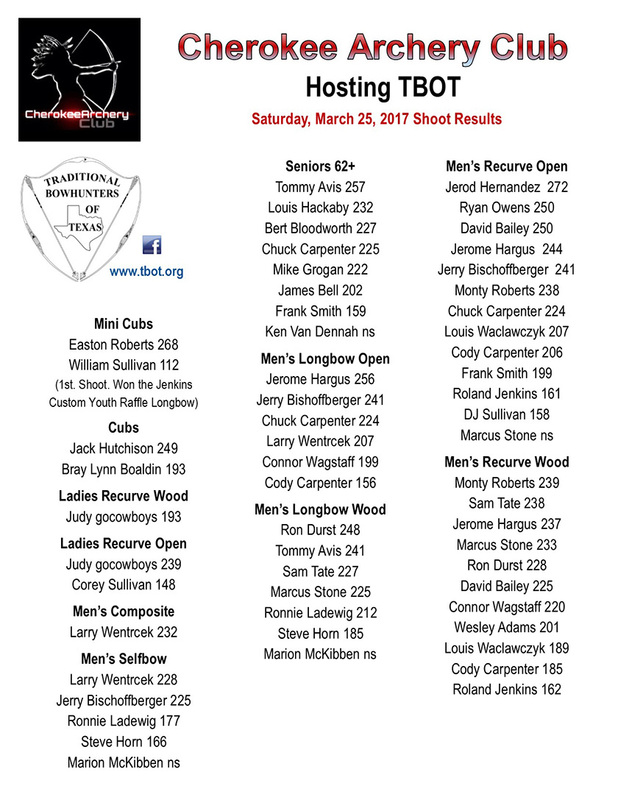 Cherokee Archery Club - TBOT March 25, 2017 Shoot Results. Thank You Cherokee Archery Club (Monty Roberts) for hosting TBOT again this year. It's hard to beat the Hill Country Scenery - great course! Thank You Jill Tate for the wonderful lunch. Thanks to our TBOT South Texas Rep. and TBOT VP Larry and Jamie Wentrcek for keeping things running smoothly - you guys rock. Special Thanks to Raffle and Score Card give away donors: Miller's Smokehouse in Llano (Winner: Monty Roberts, Cooper's BBQ in Llano gift card, Hill Country Gifts and Wild Herbs: Gina Shaffer in Llano (Winner: Larry Wentrcek), KC Kreger of Traditions Leathercraft: Leather TBOT Arm Guard (Ryan Owens) and Roland Jenkins: Custom Youth Longbow (Won by 7 year old William Sullivan - his first shoot), and Hoffy's Archery in Lampassas: (5) - $100.00 gift cards (Winners: Glenn Buchhorn, Jill Tate, Ronnie Ladewig, Corey Sullivan and Ron Durst). See y'all at the upcoming TBOT 3D shoots.